By 1900 Cracow became the most densely populated city of the Austro-Hungarian Empire. The construction activities in the city almost ended as they were limited by the 1860-1866 fortifications, and by construction regulations (Bauverbot). Thus negotiations by the municipality, concerning the territorial expansion and removing of the inner ring of fortifications took place and finalised in 1907. In 1909 begann the levelling of the curtain embankments and the demolition of the bastions and the 1887 fortress gates . In 1907 construction of new fortifications in the western and north-western part of the ring commenced and lasted until 1910. After that a system of little modernized older forts, and relatively advanced smaller fortifications was in place. A continuous line of fortifications, with ground embankments and shallow moats, was constructed only where needed. For the remaining perimeter solely permanent barbed wire obstacles were planned. The road network displayed a radial / peripheral street system. Radial roads (Radialstraβe), linking the city centre with peripheral areas, were intersected with ring roads (belt roads – Gürtelstraβe), which provided traffic connections along the inner perimeter of the fortifications. The new fortress gates were located in intersections of these two elements of the system in order to allow easy access to the foregrounds. In total five guardhouses with gates were built. The “Bielany” gate protected the route along the Vistula river, running through Bielany to Tyniec and Skawina. 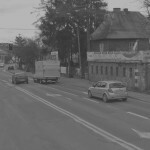 The “Wola Justowska” gate closed the main street of the village of Zwierzyniec, running to Wola Justowska. The “Łobzów” gate blocked the Prussian Route that ran towards Bronowice. The “Prądnik Biały” gate was located at the road running in the direction of Biały Prądnik, and finally the “Prądnik Czerwony” gate was erected at the Warsaw Route, running through the village of Prądnik Czerwony. The only exception was the “Kościuszko” gate, because it was built without a guardhouse, and it blocked a local access road from the side of the “Kościuszko” mound and fort, situated outside the ring of the fortifications. The architectural layout of the gates was very adequate. 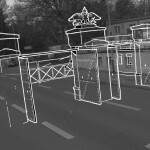 Roads were closed with steel gates located between brick pillars, with the span of 3.7 m. The middle pillar, sitting in the axis of the road, was higher and crowned with a two-headed eagle (Doppeladler). Each entrance was to be equipped from the outside at least with two closures, located one after the other (in the distance of approx. 9 m), so that the gate could be closed, whereas the second one would open in order to allow the passage. While letting people and patrols in and out, it was ensured that both closures were not be open at the same time. Between the pillars of the gates also wooden beams could be inserted for reinforcement. Small detachments were supposed to be enough to defend the gates, but they needed to be fully protected against enemy shelling. Hence small one-storey shelters – guardhouses were built. They consisted of the standby (alert) room (Bereitschaftsraum), a toilet (Abort) and the officers’ room (Offiziersraum). Water was to be provided from wells located in the vicinity or from the municipal water supply network. Between the external and internal closure, there was a small courtyard, the so-called ward (Zwinger). The remaining walls of the courtyard were the wall of the guardhouse with embrasures, from which it was possible to cover a small space with rifle fire, and a retaining wall on the opposite side of the road. In order not to open the main gate every single time, an additional a smaller door was placed for pedestrians. It was called a patrol wicket. The wicket was located near the steel sentry box (Schilderhäuschen). The 1910 “Prądnik” gate guardhouses introduced a modification of the floor plan. By placing a part of the exposed (external) wall in an oblique position, three additional rifle embrasures were allowed, which covered the foreground of the embankment. Less important facilities and the structures of the inner ring – Noyau – were built in a lower standard for economic reasons. So these structures had only an impact resistance against medium calibres (approx. 150 mm/granatsicher). In compliance with the design guidelines, the 150 cm-thick exposed walls were made of limestone. The exposed walls were additionally protected by a massive ground mound and a stone mattress, which compensated the energy of the shells. The 90 cm-thick walls from the side of the courtyard and from the side of the outfield (the interior of the fortress), were made of bricks. Steel ceiling girders were arranged approx. every 36 cm. On top of that structure a 90 cm flat concrete roof was built. The roofs were covered with strips of galvanized steel and a 50 cm ground layer covered with grass in order to camouflage them. After WWI the Polish Army took over the facilities of the fortress. 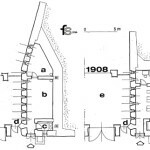 1920ies inventory drawings show that most gate closures and pillars did not exist anymore. According to the list, the guardhouse of the “Prądnik Biały” gate was rented “for an office for an annual rent”. The other guardhouses were “unoccupied”. The guardhouse of the “Wola Justowska” gate was later on adopted as a technical building (pump hall). Until today two guardhouses have been preserved: the “Bielany” guardhouse and “Wola Justowska”. Across the years, the ground mounds from the front and the roofs were removed and the embrasures were transformed into secondary windows. The “Wola Justowska” guardhouse lost its steel sentry guard and a section of the retaining wall. 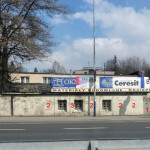 Both guardhouses are listed buildings – the “Bielany” guardhouse is included in the register of historic sites (entry No. A-876 dated 22.03.1991), whereas the “Wola Justowska” guardhouse is included in the municipal register of historic sites (No. 2902). The buildings are used as commercial premises and they are in a quite good condition. 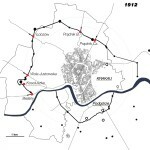 Da um 1900 die Stadterweiterung in Krakau an ihre Grenzen gestoßen war, stellte die Stadtverwaltung einen Antrag auf Niederlegung der inneren Umwallung. Dies wurde genehmigt und die Stadt konnte die fortifikatorischen Gründe erwerben und im Jahr 1909 mit der Einebnung der inneren Umwallung – vornehmlich den Kurtinen – beginnen. Zur Sicherung des Festungsinneren (Noyau) war es nunmehr notwendig, neue Festungstore zu errichten. Insgesamt wurden fünf solcher Toranlagen an den wichtigsten Ausfallstraßen realisiert. Der Entwurf der Toranlagen kann als sehr zweckmäßig angesehen werden. Die Straßenabschnitte konnten durch Stahltore (je ein Flügel pro Fahrbahnrichtung), die in gemauerten Pylonen (aus Ziegel) verankert waren, geschlossen werden. In jeder Anlage waren zwei Torebenen etwa neun Meter hintereinander angeordnet, was zusammen mit dem Wachhaus und einer gegenüberliegenden Abschlussmauer eine Zwingersituation ergab. Der Torbetrieb war durch die Militärverwaltung strikt geregelt. Um die großen Tore nicht jeweils öffnen zu müssen, waren kleine Pforten für Fußgänger angeordnet. Der Durchgang konnte durch eine Art Koffer (aus Stahlblech) bestrichen werden. Im Ernstfall sollten die Stahltore durch eine Holzverschlichtung, die in vorgesehene Schlitze der Pylone einzusetzen waren, verstärkt werden. Ein Doppeladler bekrönt jede Toranlagen. Die Tor-Wachmannschaften waren vor Beschuss geschützt in den Wachhäusern untergebracht. Neben einem Bereitschaftsraum umfassten die Torwachhäuser einen Offiziersraum und eine Toilette (Abort). Aus Gewehrscharten des Wachhauses konnte der Zwinger zwischen den Toren bestrichen werden. Die Wasserversorgung erfolgte über die städtische Wasserleitung oder in der Nähe gelegenen Quellen. Nach dem Ersten Weltkrieg übernahm die polnische Armee die Objekte der Festung Krakau, allerdings wurden schon in den 1920er Jahren nicht mehr alle Tore militärisch genutzt bzw. standen bereits leer. Bis heute haben sich von den ehemaligen Festungstoren zwei Wachhäuser erhalten: „Bielany“ und „Wola Justowska“. Beide Wachhäuser stehen unter Denkmalschutz. Site of the fortress gate “Wola Justowska” with the remaining structure of the guard house/ Standort des ehemaligen Wola Tores mit dem heute noch existierenden Wachhaus.